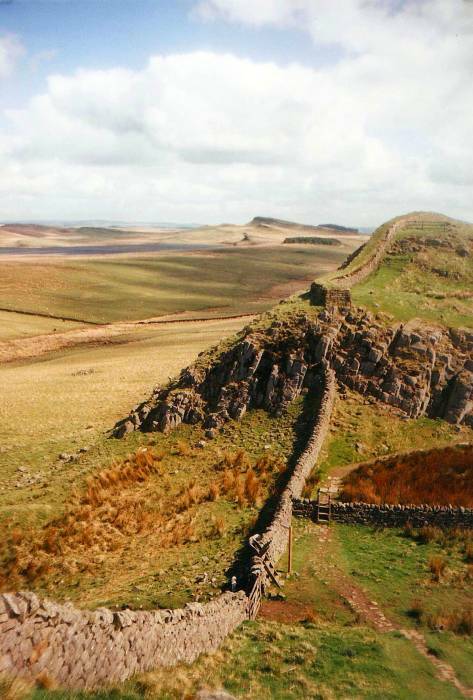 Let's walk along Hadrian's Wall, which crosses Britain from east to west at a narrow point. It runs 80 miles from Solway Firth, near Carlisle on the west coast, to the mouth of the Tyne River, near Newcastle on the west coast. Today's Britain was Roman Britannia, but only up to the point where the Roman legions could beat back the Picts coming south out of Scotland. 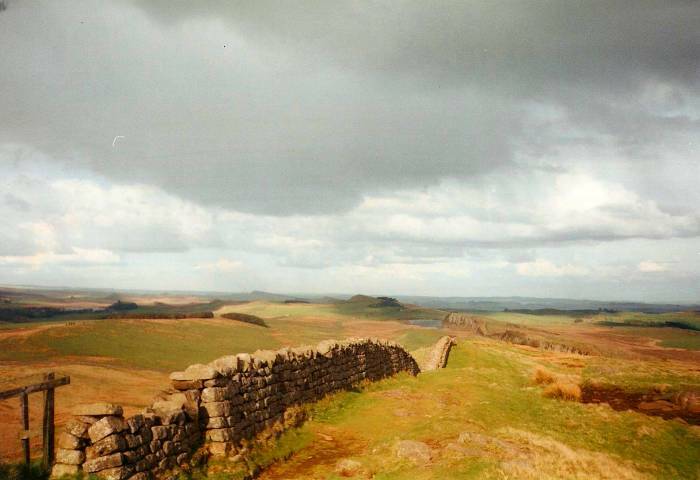 The Emperor Hadrian had a wall built coast to coast to fortify his northern border. It took six years, 122-128 AD, and involved the moving of an estimated 2,000,000 cubic yards of earth. This was the largest engineering project undertaken by the Romans. Map of the UK, X marks the center of Hadrian's Wall. A ditch (3m deep, 9m wide) was dug immediately in front of the wall, and the earth formed into a rounded hump beyond that. The wall itself was built of stone blocks. There was a gate every Roman mile (1480 meters, or 0.9196 statue miles). A small fort called a milecastle guarded the gate. Then between each pair of milecastles were two observation turrets — there was an outpost every 494 meters. The milecastles are numbered from east to west, with the turrets numbers A and B: Milecastle 0, turret 0A, turret 0B, milecastle 1, turret 1A, turret 1B, and so on. Then there were a series of forts some distance south of the wall and 16 forts right on the wall. Some time during the early 400s the Roman administration faded away and the communities along the wall either became fully self-sustaining or faded away. They hadn't really been all that "Roman" for some time, with the military and administrators recruited locally for many generations. See the red X on the map for the rough location of the center of the wall. You will, of course, want a real map. 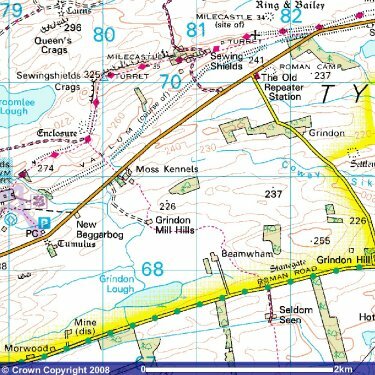 Get an Ordnance Survey 1:25,000 map. 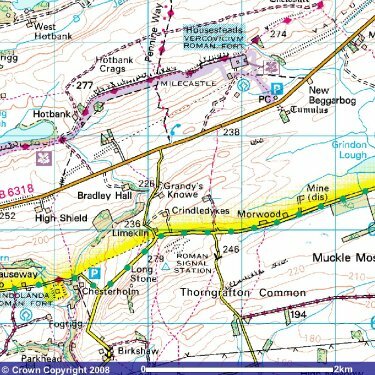 I used the Explorer OL43 map, titled "Hadrian's Wall; Haltwhistle & Hexham". Also see my page explaining how to navigate using the National Grid coordinate system. These 1:50,000 scale maps are from Explorer OL43, "Hadrian's Wall; Haltwhistle & Hexham". They show from west to east the extent of the wall that I walked. You will find the 1:25,000 map more useful when hiking along the wall. This Tactical Pilotage Chart TPC E-1B shows the entire route, although the wall does not show up as a landmark on the 1:500,000 TPC. 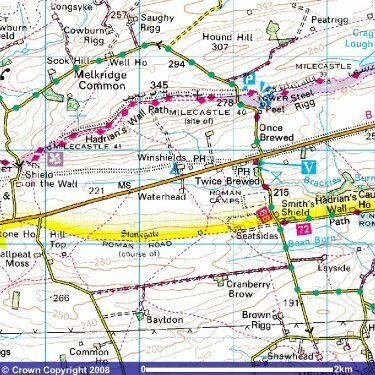 The area where I walked is north of the east-west road between Haltwhistle and the shaded outline of the military aircraft operating area. Here are some pictures from my visit. They're scans of photos taken with a US$ 10 camera, but they provide the general idea. Some people walk the wall end to end. I just covered the section between turrets 35B and 42A, which is the most scenic central section. This is the view east from turret 39B. Turret 39B along the central section of Hadrian's Wall. Here we are looking east along the cliffs and bluffs around milecastle 39. It is an impressive structure even though relatively little remains today! Cliffs and bluffs near milecastle 39. 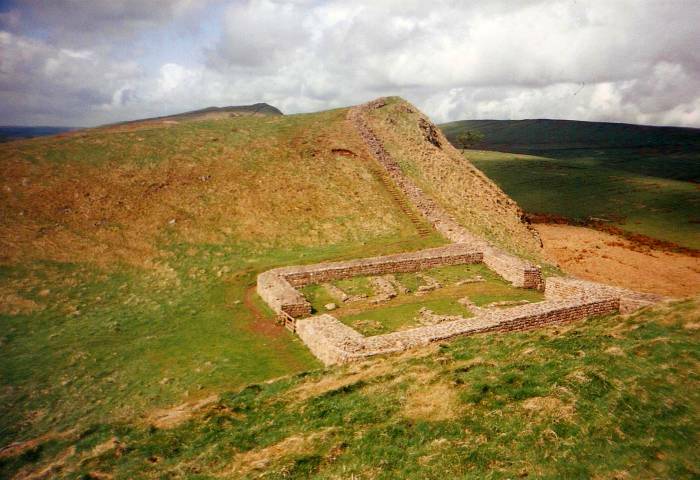 Some sort of wall was probably planned before the Roman Emperor Hadrian visited Britain in AD 122. Four or five years before that, Hadrian had expressed a desire to "keep intact the Empire", a desire imposed upon him "by divine instruction." That much is recorded in some carved sandstone fragments dating from 118 or 119 and found in Jarrow. That inscription continues to announce the construction of a wall. 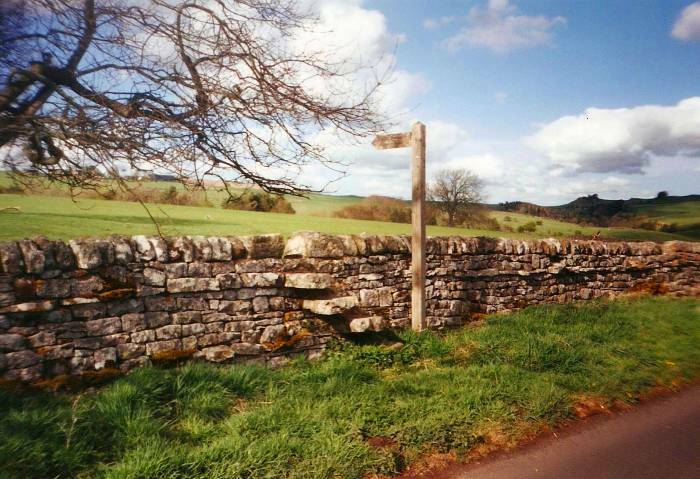 A common misunderstanding is that the wall marks the boundary between England and Scotland. It actually lies entirely within England. It comes within one kilometer of the Scottish border at Bowness-on-Solway in the west, but it is 110 kilometers south of the border at its east end. After that 118-119 announcement, construction probably started in 122, allowing Hadrian to inspect the early progress during his visit. Construction started in the east and worked toward the west, largely paralleling the Stanegate Road between Luguvalium (now Carlisle) and Coria (now Corbridge). A series of forts was already in place along that road. The plan was for a wall 80 Roman miles long — 73 statue miles or 120 kilometers. There would be a small gated "milecastle" every Roman mile, each staffed with a few dozen troops. Between each pair of milecastles would be evenly spaced turrets for protected observation and signaling, placing a staffed fortification every one-third of a Roman file, about 500 meters. 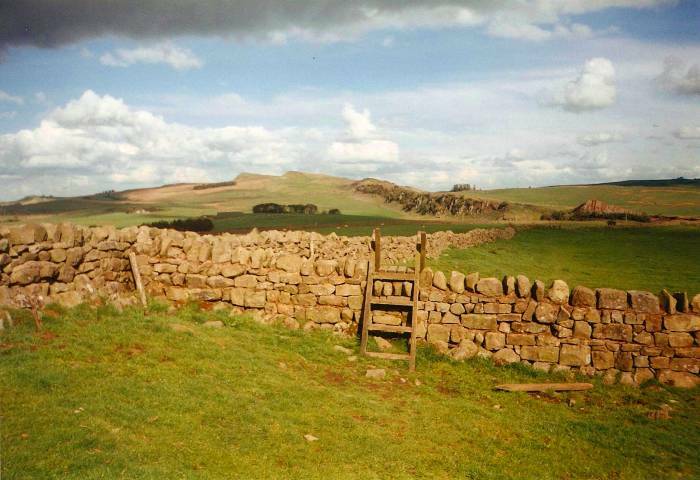 It would be, for example, milecastle 38, turret 38A, turret 38B, then milecastle 39. 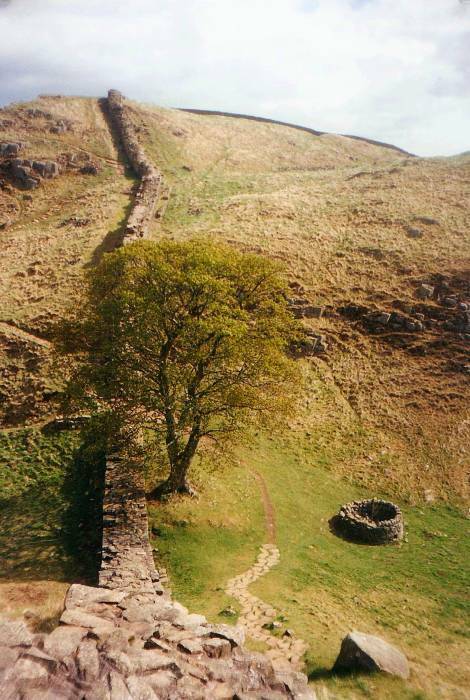 The practical implementation shifted the milecastles up to 200 meters either direction to better utilize features of the landscape or to support visual signalling to the Stanegate series of forts to the south of the wall. Steep path near milecastle 39. The wall itself would be constructed from locally available material — squared stone east of the River Irthing and turf to its west. The stone section would be three meters wide and five to six meters tall. The turf section would be six meters wide and 3.5 meters tall. On the north side of the wall would be first a ditch and then a berm, at least in the places where the local topology supported this cross-section. In some areas the natural topology provided protection well in excess of what a berm and ditch could do, as in some segments of the section seen here. Three Roman legions were involved in the construction, the Second, Sixth and Twentieth Legions. They left their inscriptions in the turrets and milecastles, and this shows that the three legions each used their own unique slightly different designs. The wall was mostly complete in AD 128, after about six years of construction. The Augustan History is the only contemporary source of information about its origin and construction. There is no source surviving to tell what it was called in antiquity, no historical literary source calls it by a name. "Hadrian's Wall" is a much later label. It's much as if the federally built, multi-lane inter-state highways in the United States were called "Eisenhower Highways". Come to think of it, "Interstate Highways" is an awfully utilitarian name of nearly Soviet lack of imagination. "Eisenhower Highways" would be a better name. Anyway, a small Roman enamelled bronze cup was discovered in 2003 in Staffordshire. An inscription on it indicates that the wall was known as Vallum Aelium or "Aelian Wall". Aeli was Hadrian's main family name or nomen, he was of the gens Aelia. So, yes, it was Hadrian's Wall after all. 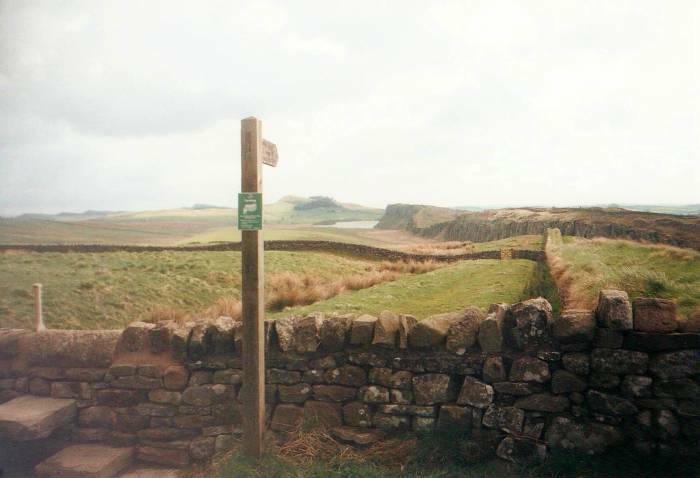 Below we are looking over the ruins of milecastle 39, the wall itself, and to the north. 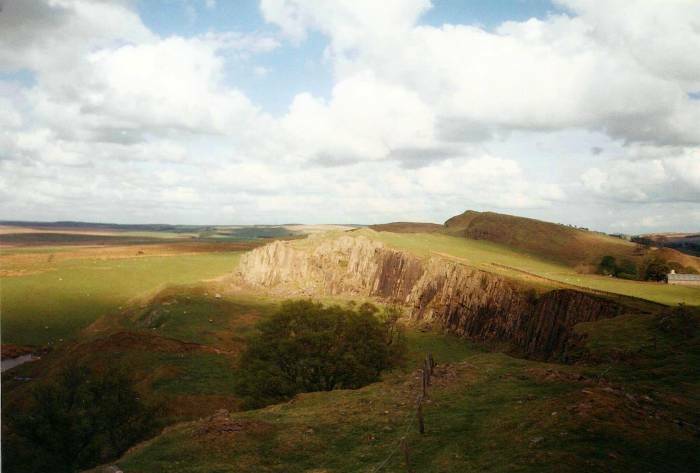 The milecastles were against the southern or English side of the wall. Milecastle 39, near Steel Rigg, provides a good example with fairly well-preserved remains. A typical milecastle would be about 15 by 18 meters internally, with stone walls up to three meters thick and five to six meters tall, matching the wall itself. Each milecastle guarded a gateway through the wall. Notice the short break in the wall itself and the corresponding gate on the opposite side of the milecastle. These would have been closed by heavy wooden gates back in the day. A garrison of maybe twenty to thirty troops would be housed in two barrack blocks. These were auxilliary troops — not legionaries and not Roman citizens. 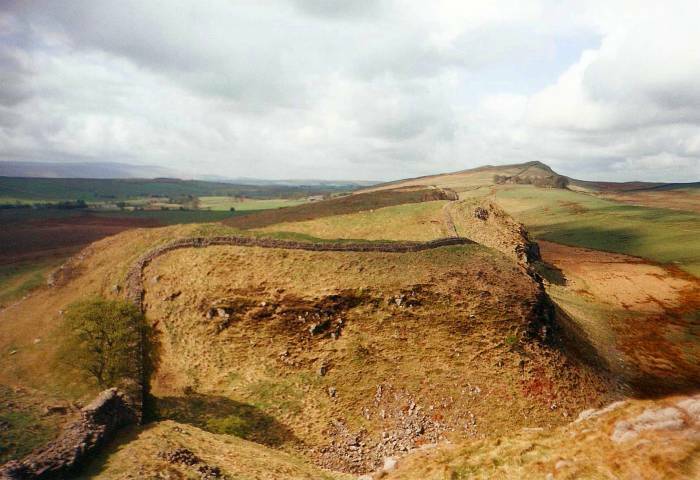 It seems that the point of the wall and the milecastles was not entirely military, keeping the Picts north of the wall, but it also had a significant role as customs posts leving taxes on transported across the wall. Hadrian's biographer, clearly not some Bob-Woodward-like independent journalist but in the employ of the Empire, wrote that Hadrian "was the first to build a wall 80 miles long to separate the Romans from the barbarians." The Highshield Crags around turret 38A. There is disagreement over the scale of the threat actually posed by Scotland, and whether there would have been any economic advantage in building and garrisoning a fixed line of defenses as opposed to conquering the Scottish lowlands and defending it with widely spaced forts. More elevation changes around milecastle 38. The control over immigration, smuggling and trade, and the collection of customs duties, makes for a compelling explanation. But keep in mind that Hadrian was the Roman Emperor. Some of what he did was done simply because he could. Highshield Crags and shadows of the clouds. A number of full-sized forts were added along the length of the wall within a few years of the start of construction. Historians disagree, it was from 14 to 17 added forts. Each of these housed 500 to 1,000 auxilliary troops. The entire wall may have had a little over 10,000 troops total. The majority were auxilliary troops, not Roman citizens or Roman legionaries. 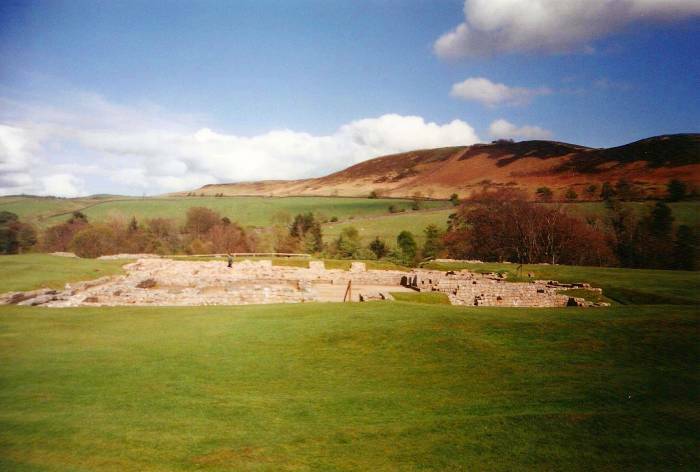 Vercovicium, now known by the modern English name Housesteads Roman Fort, was added between milecastles 36 and 37. 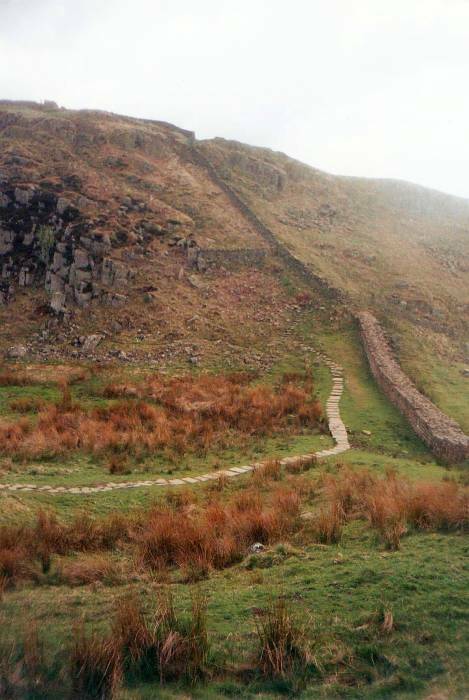 It was built in 124, during the construction of the wall, over the top of a milecastle. It is of unusual design for the major wall forts, as it lies beside the wall with its long axis parallel to the wall. Most of the major forts of the era straddled the wall, thus protruding slightly into barbarian territory. The local topography required this different design. In the 2nd century, it was garrisoned by a double-sized auxilliary infantry cohort plus a detachment of legionaries from Legio II Augusta. In the 3rd century, it was garrisoned by Cohors I Tungrorum, along with the Numerus Hnaudifridi and the Cuneus Frisiorum. In the 4th century, the Tungrians remained, according to the Notitia Dignitatum. But by 409 AD, the Romans were gone. Vercovicium fort, between milecastles 36 and 37. There was a large vicus or civil settlement outside the fort's defensive wall on its south side. Unusually for Roman Britain, there was no source of running water. The fort and the vicus depended on the collection of rainwater. The fort's latrines are very well preserved. See more about them on my Toilets of the World site. As you see at the museum at the nearby Vindolanda fort, life here during Roman times was, by our modern standards, much more comfortable than it was for the local crofters in the mid-1700s! Vindolanda fort is a short distance south of Vercovicium. It was an auxilliary fort or castrum guarding the Stanegate road from the Solway Firth to the mouth of the River Tyne. The modern village of Bardon Mill was built near the fort. The earliest fortifications here were wood and turf. The first was built about 85 AD. The 1st Cohort of Tungrians probably built that one. By about 95 AD the 9th Cohort of Batavians, a unit of about 1,000, had replaced that with a timber fort. The Batavians left in 105 AD and their fort was demolished. Back came the Tungrians, who built a larger wooden fort. Then, with the Wall's construction starting in 122, this fort's men were moved north to the wall. A stone fort was built here, possibly manned by the 2nd Cohort of Nervians. Heading south from Vercovicium fort to Vindolanda fort. Hadrian died in 138. The new emperor, Antoninus Pius, started building a new wall which — to no one's surprise — was named the Antonine Wall. This new wall was about 160 kilometers to the north, across an even narrower span of the island of Britain in what today is called the Lowlands of Scotland. The Antonine Wall was a stone and turf structure running about 40 Roman miles between the Firth of Forth and the Firth of Clyde. It took longer to build, with construction lasting 142-154 AD. 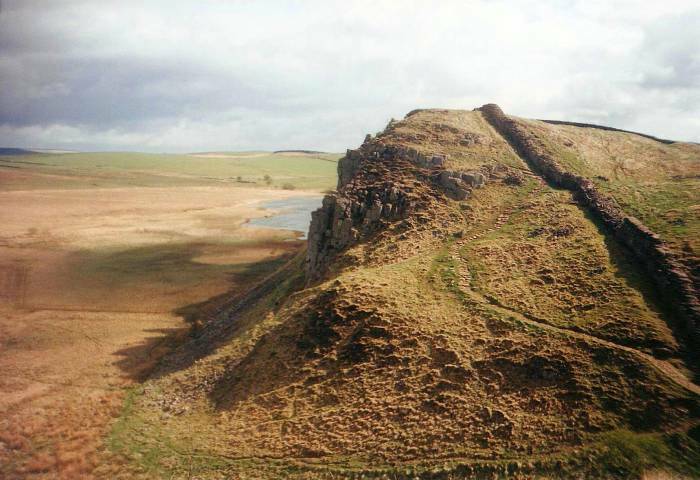 It had more forts than the longer Hadrian's Wall, but Antoninus was unable to conquer the Caledonians. The Romans gave up on their northern expansion and retreated back to Hadrian's Wall in 164 AD after Marcus Aurelius had become Emperor. After a series of attacks from the north in 197 AD, the Emperor Septimius Severus traveled to Scotland in 208 to secure his northern frontier, and repaired and briefly re-occupied parts of the Antonine Wall. However, that re-occupation lasted just a few years. Through the centuries of occupation, the garrisons at least partially integrated into the local community. The troops from Gaul dedicate this statue to the goddess Gallia with the full support of the British-born troops. This indicates that the Fourth Cohort of Gauls really contained native Gauls who wanted to distinguish themselves from the local British recruits. The vicus or village outside this fort had several rows of buildings. The baths and latrines of the Vindolanda and vicus are also well preserved, see my Toilets of the World site for more details. 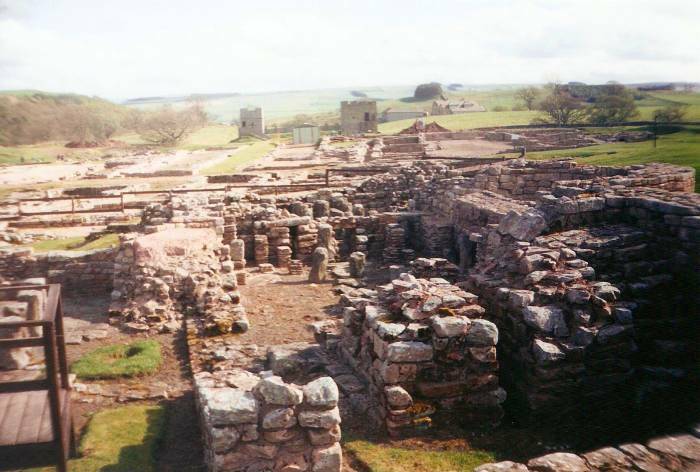 Baths and latrines of Vindolanda fort. In 1973, the Vindolanda Tablets were discovered. They are the oldest survivng handwritten documents found in Britain, and provide the best view of life along Hadrian's Wall. They are the earliest known examples of the use of Roman ink writing. They date to the 1st and 2nd centuries AD, showing that there was a high degree of literacy in the Roman army and revealing details of the professional and personal lives of the administrators. There are official notes about Vindolanda fort business, and personal notes from the officers and their households. The largest single group of tablets is the correspondence of the prefect of the 9th Cohort of Batavians, Falvius Cerialis, and of his wife, Sulpicia Lepidina. The nearly 500 tablets are thin sheets of wood. Various attributes show that the birch, alder and oak wood was grown locally. The tablets about 0.25 mm to 3 mm thick, typically about 20×8 cm in size, the size of a postcard. They were scored down the center and folded, forming diptychs with the writing on the inner faces. They were thought to be just wood shavings until an excavator peeled apart two that were stuck together and saw writing on the inner faces. The ink was made from carbon, gum arabic and water. The tablets had been preserved by being in an anaerobic water-saturated environment. The newly exposed wood very quickly oxidized and rendered the tablet faces black and unreadable, at least to human vision. Infra-red and multi-spectral imaging allows the writing to be seen and transcribed. The tablets were initially undecipherable, until researchers realized that they were written in forms of cursive script using an alphabet different from the Latin capitals used for inscriptions. The precise writing style varies from author to author. You can now view the Vindolanda Tablets online. Economic decline and military coups reduced Roman stability in the late 4th century, and outside pressure greatly reduced Imperial control of Britain. The men from Rome left, but a Roman influence remained and then gradually faded into the local society. The Roman administration had gradually left by 410 AD, taking the Roman Legions with it. The increasingly local-based garrisons were left to provide their own defense and govern themselves. Some parts of the wall defenses were occupied well into the 5th century. Enough of the wall survived in the 8th century for the Venerable Bede to describe the wall in his Historia Ecclesiastica. On another day, heading east from where the wall passes north of Haltwhistle, around turret 41B. The wall was largely disassembled to re-use the stone to build local structures. In the 1700s, General Wade disassembled long sections of it to build the military road which now mostly lies underneath the B6318 highway. A man named John Clayton was trained as a lawyer and became town clerk of Newcastle in the 1830s. Much of what we can see today is thanks to his purchase of land for the preservation of the wall and forts on it, starting in 1834. Rudyard Kipling (1865-1936) wrote a series of short stories about a Roman legionary named Narnesius who defended Hadrian's Wall against both Picts and Vikings. These stories increased public awareness of and interest in the wall. George R. R. Martin has acknowledged that A Song of Fire and Ice, basis for the series A Game of Thrones, was inspired by Hadrian's Wall. I doubt that anyone was surprised to learn this. The town of Haltwhistle is a fairly large town for the area. There is a passenger rail station there, but the town's name has nothing to do with the railroad. It comes from the Old English words twicce or twise, meaning "twice" or "division into two", and wella, meaning "stream", combined into twicculla or twisella, eventually becoming -twistle in English and referring to two streams. The first part of the name probably comes from Old English hēafod, meaning "hill-top". So, hēafod-twicce-wella, then hēafod-twicculla, and so on, "the hill-top where the two streams join." Early English forms of the town's name include Hautwesel (1240), Hautwysel (1254), Hawtewysill (1279), and, much later, Haltwesell (1610), and eventually today's Haltwhistle. 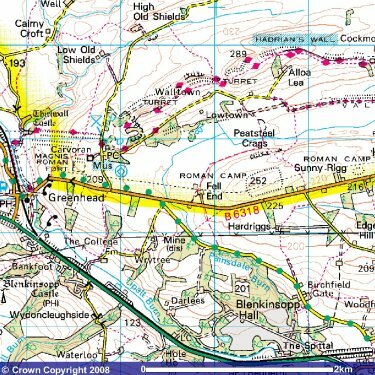 Anyway, Old English etymology aside, continue on to Greenhead, a small village on the Military Road, the B6318. Thirlwall castle, built partly from stones from Hadrian's Wall in the 12th century, is just north of the village. You can join the wall there and walk east. Here at left we are around turret 40B. Approaching the Windshield Crags around turret 40A. 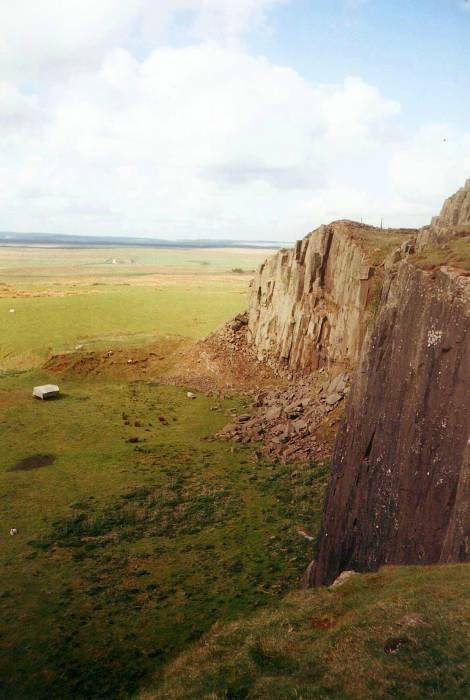 The Windshield Crags are part or the Great Whin Sill, a layer of igneous dolerite rock. Some 295 million years ago, toward the end of the Carboniferous Period, tectonic plate movement allowed the creation of largely horizontal igneous intrusions of magma. The Windshield Crags, at turret 40A. The Windshield Crags are a striking feature formed by the sill. This roughly linear feature was a natural defense and obvious location for the defensive wall. I stayed at the Twice Brewed Inn. To get here, at least in the off season, take a train from Newcastle to Henshaw. From the Henshaw train station to Twice Brewed it's a walk of about 3.5 kilometers with about a 100 meter elevation gain. 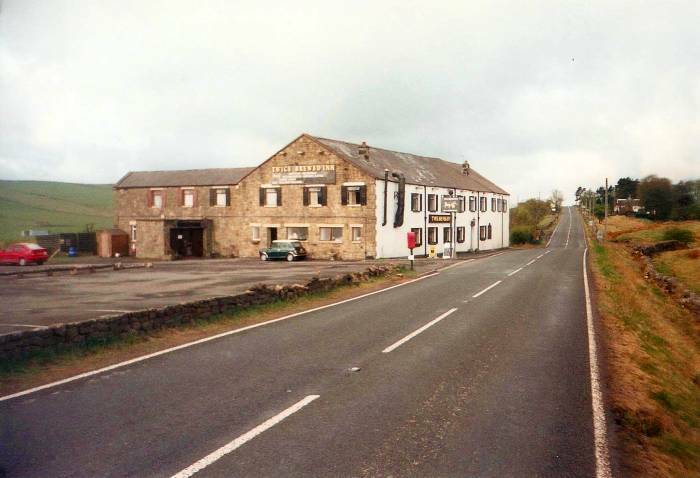 The inn is on the B6318 road. Depending on your map, you will see "Twice Brewed", "Once Brewed", or perhaps both. There is also a Once Brewed Youth Hostel and a National Park visitors' center.